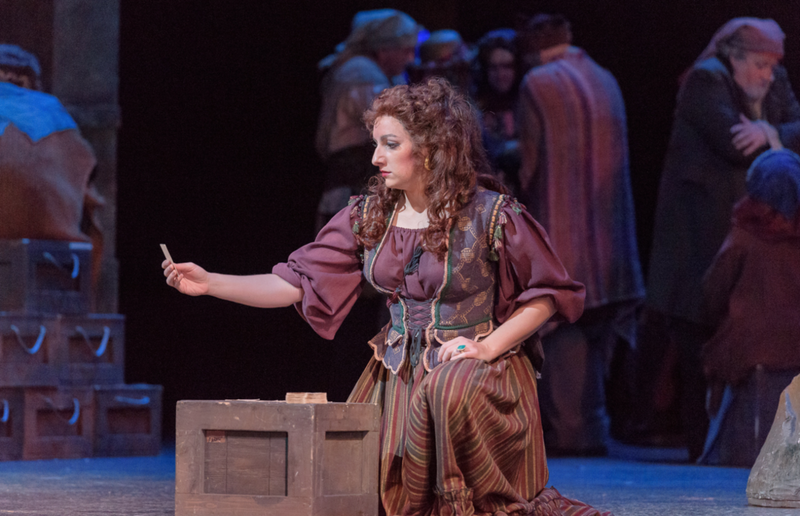 "Aleks Romano undertook the role in the revised version, and she is a force to be attended... Her voice resides in the chest, but is not restricted by it. She is in command of her lines and the emotional pitch of her cavantinas and also the deeply felt shorter songs and the fiery displays. Romano has a pulse and sweep that serves character. Her glory seems natural." 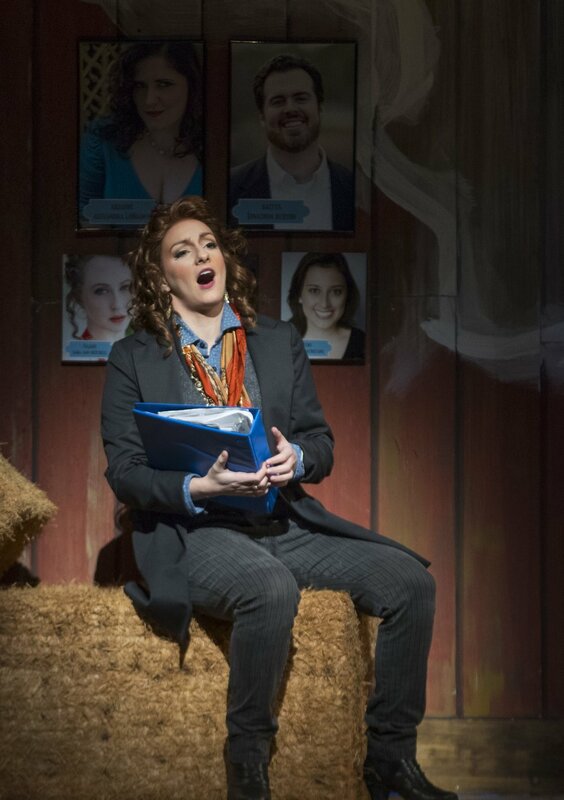 "As Tancredi, mezzo Aleks Romano navigated with ease the difficulties of the role, her voice equally beautiful, expressive and fluid along the entire span. The artist, able to express with unshowy intensity grief, disdain or hope, was as effective in Tancredi’s arias as she was in multiple dialogues involving the character." "This does not diminish the efforts of the singers who, when called upon, conquer Strauss' daunting musical challenges. Romano and the grand Alexandra LoBianco ...have resonant, powerful voices..."
"...for much of the production, the Composer, played with sensitivity by Aleks Romano, acts as the play’s heart, an up-and-coming opera writer who believes in truth and love of her art over anything else..."
"Romano is new to the Madison stage and making her role debut as Carmen. It’s a plum role not only for well-known arias like “L’amour est un oiseau rebelle” (better known as the “Habanera”), but also because of the dramatic range it offers, from brazen and seductive to raw and vulnerable. Romano revels in it all. 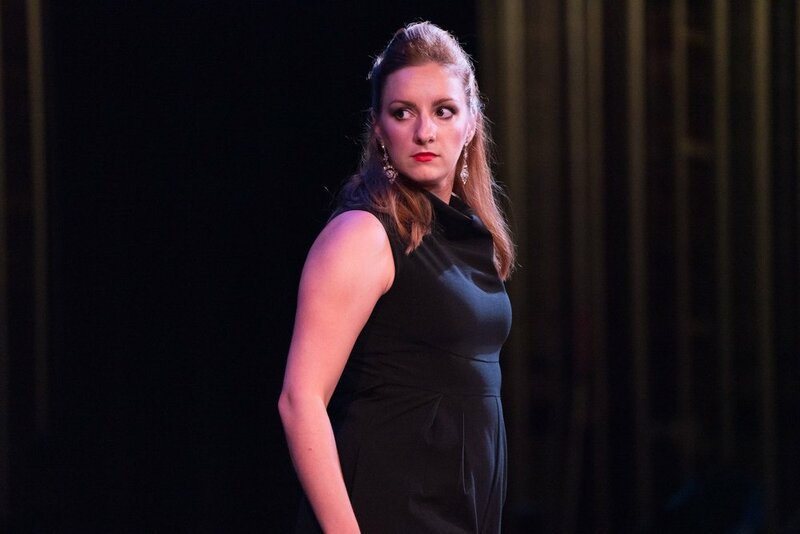 "Romano’s Carmen is calculating, always one step ahead of the men in her life, and her vocals are deeply resonant. In Act I, she leans into the trills with real pleasure while her high notes sparkle." "Aleks Romano as Carmen made the most of her complex character. Her singing was luscious, and her acting – particularly her use of her expressive eyes – was terrific." "But the star of any Carmen must be the singer in the title role. Aleks Romano... a powerful mezzo-soprano with a notably strong lower register, she really grabs the listener’s ears. And eyes, too, for she is an outstanding actress, providing a spunky anti-heroine that is difficult for either the other characters or the audience to resist. A memorable Carmen, she really gives this production its strength." "Two excellent bel canto singers headed the cast. The heroic central figure of Aurelio is a trouser role: a rarity for Donizetti, who generally used the convention only for supporting parts such as Smeton in Anna Bolena and Orsini in Lucrezia Borgia. Here it was taken by Aleks Romano, brandishing an attractively smoky mezzo-soprano and showing, in the cabaletta of her entrance aria, how coloratura can evoke machismo... when Romano and Crocetto blended their voices in a two-part Act II duet, reminiscent of Bellini’s “Mira, o Norma,” they created unquestionable enchantment." 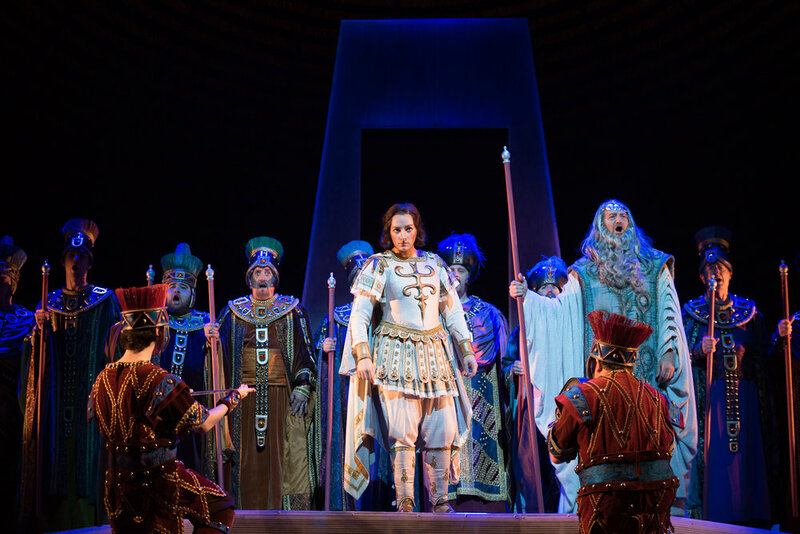 "As his brave son—the travesti role Aurelio—Aleks Romano confirmed the exciting accomplishment of her thrilling Arsace at Opera Delaware’s Semiramide earlier this year. Projecting words and great ribbons of accurate coloratura over a huge range, Romano electrified the stage whenever she appeared." ...On the basis of her Aurelio, Romano appears ready to stake out the great musico roles, such as those of Rossini – a genre in which mezzo-soprano Marilyn Horne built much of her illustrious career. Romano has already performed Arsace in Rossini’s “Semiramide” at Opera Delaware." "the leading role is the activist son Aurelio, and mezzo Aleks Romano matched Crocetto note for note in virtuosity and tonal allure. First, I have never seen a woman in a trouser role look so believably manly. The petite singer is as convincing in her gender-bending as Hilary Swank in her Oscar winning turn as Brandon Teena (Boys Don’t Cry). Ms. Romano has a searing vocal delivery, her exciting, focused tone appealingly colored by a somewhat urgent vibrato. When Aurelio is riled up (which is often), she hurls inflammatory declamations that ring thrillingly throughout the house. But when she shares loving, concerned duets with Eleonora, Aleks can hone her secure tone to a tender filigree of sound that is heart stopping in its emotional effect. There are two duets in which these two remarkable vocalists sing melting phrases in thirds that are not meant merely for human ears. As their inimitable instruments tumble over each and urge each other to ever greater emotional engagement, well, this is as good as it gets." "Leading the good sized cast is mezzo Aleks Romano in the “pants role” of Aurelio, son of the mayor. Romano’s voice is a wonder, focused and pure and bringing a clarity to every scene and ensemble." 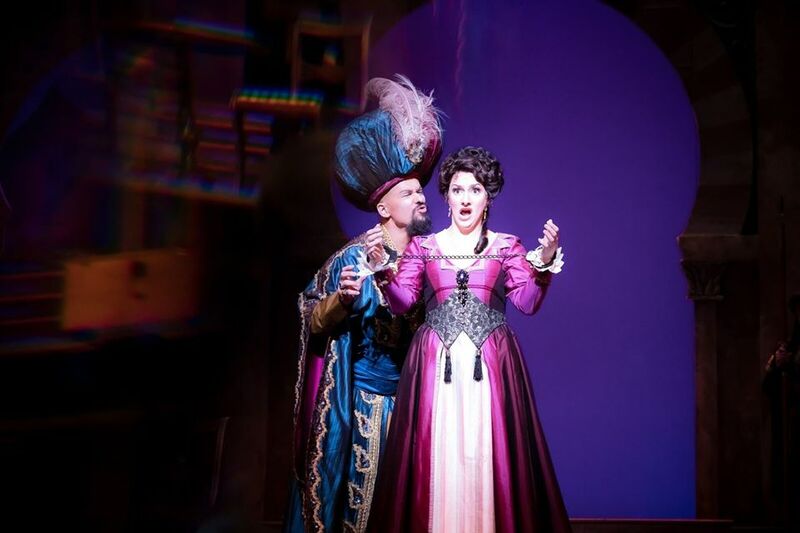 "mezzo Aleks Romano was a poignant Aurelio"
"I last heard Aleks Romano ten years ago, when this young Connecticut-born mezzo was an undergraduate (I assume) singing in the chorus of a Zemlinsky double bill at Bard College. As Arbace, she demonstrates that ten years of vocal training at Yale and in young singers’ programs has produced remarkable agility, evenness of registers and musical insight—as well as expressive acting. Her performance, and increasingly high-level experience, suggest a singer headed for the top." "Isabella, magnificently sung by the beautiful mezzo-soprano... twisted him around her finger with the same ease with which she sang the demanding coloratura part Rossini composed. But it was the rich color and power of her deep voice, the dramatic intensity and emphatic enunciation, rolling her "Rs" with derision, that were most striking. And those constantly moving eye-brows as she planned and plotted each ploy, from the first reversal of the roles of captor and captive, a neat rope trick, to the ultimate escape with Lindoro in tow."